The Frugal Family Life: Rare $1/1 McDonald's Coupon ($1 off Chiller, Frappe, Smoothie or Lemonade)! Rare $1/1 McDonald's Coupon ($1 off Chiller, Frappe, Smoothie or Lemonade)! Head over and print a rare McDonald’s Coupon for $1/1 any size McCafe Cherry Berry Chiller, Frappe, Real Fruit Smoothie or Frozen Strawberry Lemonade! 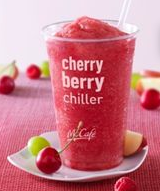 It’s being said that the fruit Chiller is just $1 at many McDonald’s locations, so FREE after coupon. I haven’t tried these, but with this coupon, I think I will! The coupon is only valid at participating locations so make sure to ask first before using it!